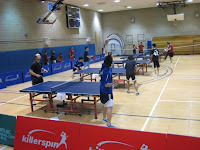 The New York City region had its regional tournament on Sunday, November 16, at FIT in downtown Manhattan. The tournament itself was a huge success thanks to the quick, efficient set-up and clean-up before and after the tournament (props! ), and because of the tournament's huge turn-out. Co-ed matches lasted from about 10am to after 7pm, and the women's matches lasted from about 10am to around 3pm. In both co-ed and women's, Rutgers dominated the scene by going undefeated in both events, so congratulations to the Rutgers' co-ed team: Judy Hugh, Adam Formal, Iuliana Radu, Wing "Leon" Sit, and Jin Yang; and to the Rutger's women's team: Judy Hugh, Iuliana Radu, Jin Yang, Rekha Bachwani, Shriya Patel, and Elizabeth Cho. On another bright note, Columbia's co-ed and women's teams both got 2nd behind Rutgers, losing only to Rutgers, so KUDOS to the Columbia co-ed team: Carlos A. Perilla, Victor Leung, David Loeffler, Vanck Zhu, Shih-Hung Hsu, James Skoufis, Kagan Irez, and me; and to the women's team: Lina Cao, Jenny Chen, Wendy Mu, Vivian Wang, Dehui Kong, and me! This was the first of two regional tournaments (the next one will be in the spring), and the top two teams from each region get a bid to the College Nationals, being held in Minnesota this year. Although the tournament took basically all day and drained the hell out of everyone there, it was great to see old friends and meet new ones. Teams that went included Columbia, Yale, Stonybrook, Rutgers and NYU, [among others], and some matches got heated and intense; the best ones to watch throughout the day were probably NYU vs Stonybrook (or really NYU vs anyone, what with their energy level and team spirit, contributed mostly by Joe Kim) and Columbia vs Rutgers, with both ties going down to the wire: NYU and Rutgers both won in the 5th game of the 5th team match (the format of NCTTA tournaments are best 3 out of 5 team matches, with 4 singles and 1 doubles, so if you see tight doubles matches going on, chances are that the team tie is at stake). "If any[one] was born in another country and never represented USA at the World Junior Championships and want[s] to represent USA in the future, please read the attached document, fill out and sign the form... and send it back to me ASAP"
According to the new ITTF eligibility rule, players under 21 years old and were born in another country, but wish to represent the United States have to be registered with ITTF through USATT. In addition to the provisions of 3.8 (the general rule of eligibility) players being eligible to represent an association other than the one they intend to represent, shall register with the ITTF, through this new association. * 7 years after the date of registration, if the player is under the age of 21 but at least 18 years of age when registered. 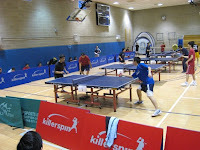 Players being 21 years of age or older will not be registered with the ITTF and will not be eligible to represent a new association at World Title events. Players who have already represented USA at a previous World Title event will keep that eligibility and do not need to register with ITTF. So, if this applies to you, and you want to represent the US in future international tournaments, EMAIL DORU for the form!!! I also have a copy of the form as well, so you can email me at so90crazy@gmail.com too, but it would probably be better for you to just contact Doru directly. Despite its ridiculous-sounding name, Sinus is a really great rubber. It's the sort of off-spring/next generation of Nimbus, and was designed specifically with the forehand and those who are used to hard, spinny rubbers in mind. Actually, the Nimbus was really intended to be mostly a backhand rubber, but it's definitely versatile and all-around enough for a forehand rubber (I used it for around four months until last night, when I tried Sinus). For anyone who's looking for that powerful, explosive, spinny shot that you used to have with harder sponges, definitely try this one out. I like it more than Butterfly's Tenergy, because I feel like you get a better grip on the ball with Sinus, and more control overall. And to answer Alex's question from the last post, I was talking specifically about Butterfly's glue... Sorry for any confusion or issues that ambiguity may have caused! Speaking of which, college table tennis has definitely been an experience. I would venture to say that the Columbia table tennis team practices quite a lot for a college team, and that we're a relatively cohesive one at that. No politics or animosity or anything like that, and that's always a good thing. 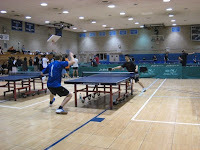 For anyone who doesn't know how collegiate table tennis works, there is an organization (NCTTA): http://nctta.org/index.html. There are different regions all across the country (Columbia is in the New York City region with NYU, Rutgers, Cooper Union, Yale, Stevens Institute of Technology, Polytechnic University, FIT, Stonybrook, NJIT, and a few other teams that are inactive this year), and teams within each region play each other at regional tournaments (ours is coming up in November!) and the top two teams from each region go to Nationals at the end of the school year. 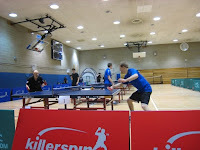 Anyone applying to college or looking at colleges that still wants to play or start playing table tennis, look to see if your schools have a club or a team. If yes, then join, if not, then look to start your own club!